This time, I've picked out two games, approximately ten years apart, which ended with rather different scorelines, and saw very different Cov owners in charge. I'll start with the later game, the somewhat less memorable of the two. Season 2006/2007 saw a somewhat average campaign. The Fairbrother years were over, with the former Cov and England prop having passed the reins to a certain Andrew Green. The game fell on the 30th of December, approaching the halfway point of the season and already Cov were well out of the promotion race, but on the other hand probably safe from relegation. Nottingham lay just one place beneath the home side, having won one game fewer, while accruing two fewer match points. 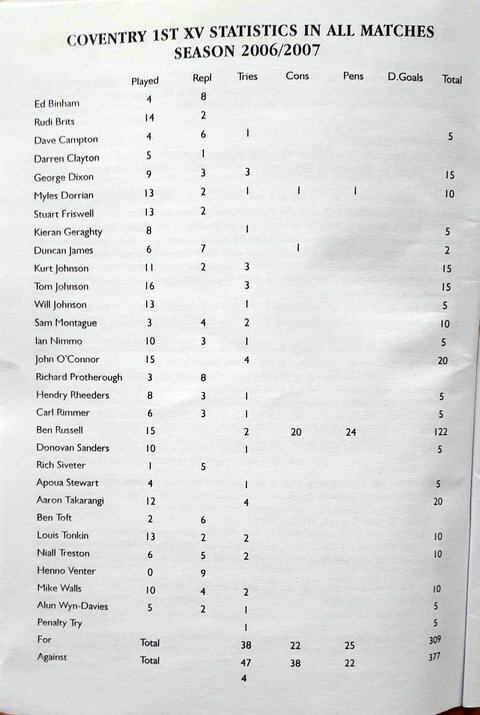 Ben Russell was Cov's top scorer on 122, well below Alberto diBernado of Cornish Pirates (202), while tries were even more scarce with erstwhile Bulldog breeder Aaron Takarangi, and John O'Connor on four apiece. In the event, with Cov still smarting from a recent heavy defeat at the hands of Rotherham (or Earth!) Titans, they restored some pride with a reasonably comfortable 29-12 win, with Donovan Sanders, Ben Toft, John O'Connor, George Dixon and a penalty try doing the damage. Goals were at a premium though,Ben Russell missing one penalty and two conversions (scoring two), while Myles Dorrian passed-up another conversion opportunity. Nottingham never gave up though, scoring all their points in the last two minutes of the game. 1646 turned up on the day, which just goes to show how current crowds are holding up given a broadly similar, latterly probably slightly worse, league performance thus far. Programme notes mentioned the EDF Energy National Trophy (what wouldn't we give for one of those now?) and the upcoming home draw vs Wharfedale, which was to be the very first meeting between the two clubs. The Yorkshire club's President John Spencer also gets a mention, being, as he was, an England centre alongside David Duckham in the early seventies. Ben Russell was announced as the new Club Captain, at age 22 believed to be the youngest ever, with John O'Connor taking the Vice Captain berth. Forwards coach Dave Addleton lamented the recent loss at Moseley, saying that it 'really should have been sewn up by half time' by Cov, but was buoyed by the hard-fought win over Exeter. A report by John Butler refers to Cov having 'dominated large areas of the match', and, 'paying the ultimate price for not turning massive amounts of possession and territorial advantage into points'. Been there before, eh? JB also reminisced about a chat with Brian Holt, covering the Bristol Cup Final win, but less enjoyably about the time Brian was sent off against Leicester at Coundon Road. Moving on (moving back!) 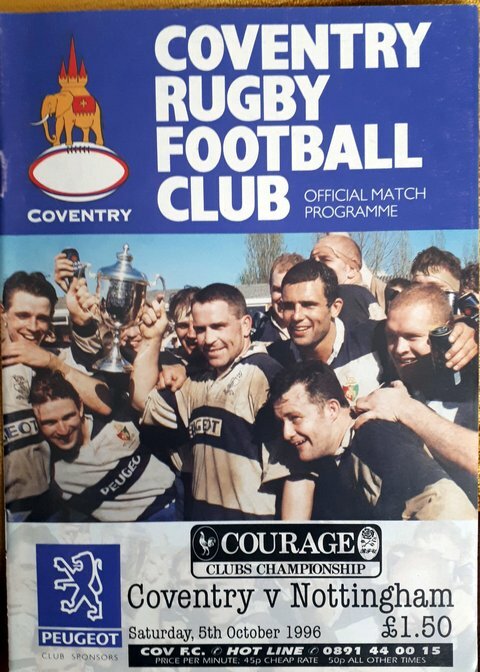 to the decade-earlier (14th October 1996) game at Coundon Road, we come to a match that will be remembered by all Cov fans privileged to be there, for all the right reasons. Records clattered, and nails (well, a nail) was added to the scoreboard. Of course, it was that win - by 102 points to 22. 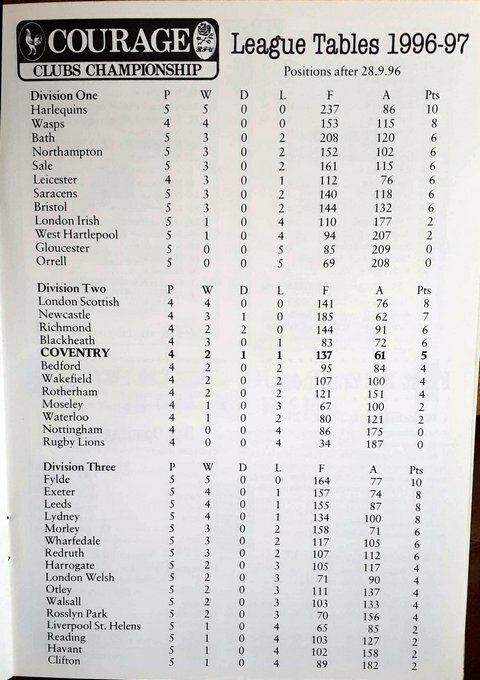 Taken in context, Nottingham had 'done the double' over Cov a couple of years earlier during the relegation season. Tries were rattled in by Mick Curtis (2), Paul Lydster (2), Derek Eves (3), Andy McAdam (3), Matt Gallagher, Lee Crofts, and a brace from Harris (who also popped a couple of penalties over to complete his personal points-fest). The net result of course, as so many will recall, was the requirement for that session of DIY with hammer and nail to facilitate the addition of the extra digit on the high-tech Coundon Road scoreboard. The match programme kicked-off with a column by DoR and openside forward Derek Eves, who described the club as a 'one million pound business', but with 'care being taken not to let professionalism run away with us', and having 'one of the smallest wage bills in the second division', citing Richmond, Newcastle, and Bedford as being at the other end of the scale. With the benefit of hindsight, Degsy might have re-worded that. He also spoke about the subsequently ill-fated deal that was struck with Leander Group to take the club forward. Derek made the point that LG had spoken to several other clubs including three in the first division, before plumping for Cov. Again, history will judge. Still, it was going to be a good season results-wise, with third place and a playoff with London Irish to decide whether we jumped up a level. It wasn't to be though, and unfortunately we can perhaps view this season as the precursor to the troubles that beset the club up until the start of the Rossborough/Sharp era. 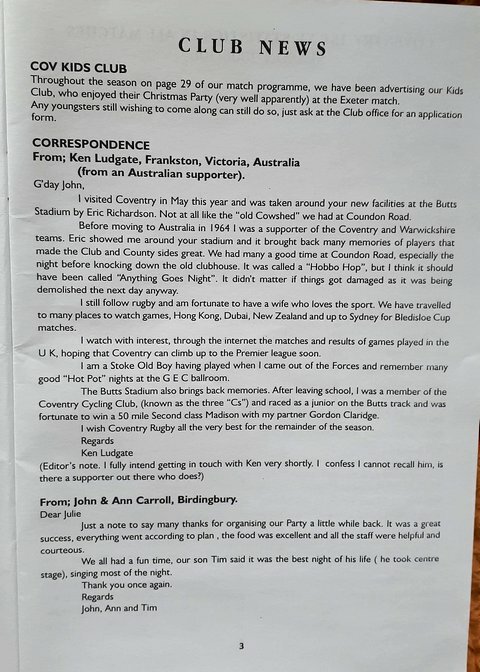 There followed an article by David Hawkins on a former Cov great, Harold Wheatley – one of the five Wheatley brothers who played for the club, and who also participated in the club's 72 match winning sequence from 1941 to 1945. Truly a Cov Legend. Physio Jackie Burke briefly covered the injury list, with a few suffering ligament strains, but Russ Morgan and Lee Crofts now being back fit and reporting for duty. However, a notable absentee was one T. Gulliver, 'who is picking up more injuries and hasn't played or trained yet! ', finishing with the aside that she'd already ordered the zimmer frame. Louise Hill's interview was with 6'4” policeman and blindside Lee Crofts. Lee reckoned his favourite games were his first ever, at home versus Richmond, and also the one against the New South Wales tourists– who were packed with Aussie Internationals. Lee also said he intended to play for Cov in the first division! There were six England 16 group, and two England 18 Group players in the squad at the time, and if memory serves these included Andy Goode, James Grindal and Adam Balding. Mention is also made of the management group of Stan Matthews, Maurice Campton, Stuart Hall, and Clive Davies. 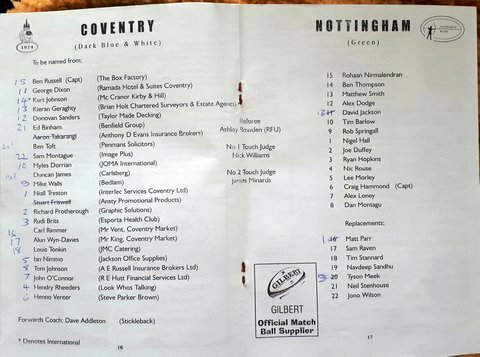 The centre pages (pictured above) include so many names that will be all too familiar to many Cov supporters, so I'll not go into too much detail here at the moment, but just look at that forward pack, even without the missing, previously ever-present, Danny Grewcock! The league tables, too, need no description from me, but already it's obvious that both today's opponents and Rugby Lions were both looking uncomfortable, and very soon Nottingham would be two points adrift at the bottom. Our record wasn't particularly bright either, but it must be mentioned that we had drawn against the soon to be elevated Richmond, and had slipped to a single point defeat at the hands of Wakey, which on a different day I'm sure we would have won. The vagaries of rugby. At least our away form was exemplary, with a 61-3 success at Rugby, follwed by a 36-17 win at Waterloo. Well, that's all in the past, and next Saturday's game has taken on more significance than we might have imagined just a few weeks ago, with a win needed to mathematically ensure Championship survival. I'd take either of those two previous scorelines! Edited 1 time(s). Last edit at 2019:04:14:14:55:25 by AdminBTCov. Cheers Mick. Took a bit of pulling together, but as long as it's not too boring! Boring... not at all!! A very enjoyable read bringing back some memories of top class players that have played for COV over the years. In 1996 the club were so near, yet in the end so far, from being promoted.....and the bridge between successive divisions seems to be getting tougher each year. Hence the lack of 'churn'in the Premiership. Mind you it would be good fun to be playing Leicester next season at the Butts! Very kind Kev. Tigers would be interesting! Remember the last time we played them in a competitive match? The last time COV played Leicester competitively....? memory reminds me of a Cup match at Coundon road, sometime in the 90's (January/February) when we won!!! 11-9 if I remember correctly. Cov were 2nd tier then I think and Leicester of course top tier, a good crowd and a great atmosphere. Bring back the good old days..... well some aspects of them! Was Martin Fairn Captain then, a class player, and was Jez Harris playing against his former club? It's a long time ago....I wasn't there but remember watching it on Rugby Special. The last cup match I remember was a quarter final 10 all draw when we progressed through by scoring more tries. Ironically we went out in the semi final in a drawn game to London Welsh who went through as the away team. The last one I remember attending (with my daughter and her Tigers-supporting friend and her dad) was January 1998 at Coundon Road when we were battered by 14-50. Can't think of a later one TBH. Who remembers the Midland Merit table night game when both Steve Brain and Brian Moore got sent off ? The last game v Leicester was indeed that date in January 1998 & yes Cov were hammered 14 -50. Last time at Welford Road was 2 years earlier, 1995/96 with Cov losing 16 -30. Now then here's one back. When did Cov last beat Leicester ? Believe it or not it was at Welford Road. Thanks John. Thought that was the last one. Will need to think about your Q though! That would be on 5th October 1991 when Cov won 22-20 at Welford Road. 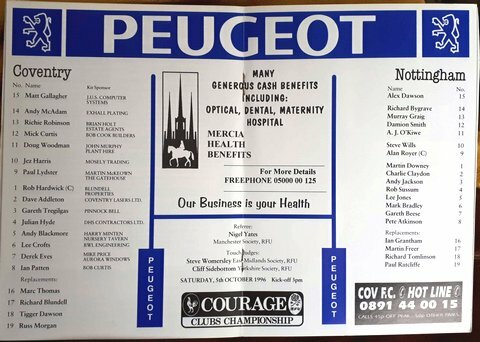 It was not a league match as we were in Division 2 of the Clubs Championship in those days with player such as Richard Angell, Steve Thomas, Martin Fairn, Kevin Hickey, Leroy McKenzie and Jason Minshull among many other stalwarts of the club.